Descent! Didn't have to pedal much the first 35 miles as I descended from 4200ft down to less than 1000ft. Also, a light tailwind to help some along the way. Had breakfast in the Julian Lodge and bundled up for initial descent through the fog/clouds. Stopped once or twice in the first five miles to warm my hands. Nice rapid descent for first seven miles, enough so that I had to put on the brakes. Greg and Michele had warned me over breakfast of another 2000ft of climb, but fortunately this wasn't along my route. Snow left and vegetation slowly changed. Several large open valleys including the one shown at picture above left. Went through Anza Borrego Desert state park with a few nice canyons to wind through. Here the route flattened out enough so that I could mostly glide without pedaling. As I passed Borrego Springs turnoff and especially at Octillo Wells, I saw hundreds of off-road vehicles: motor cycles, four wheelers, larger dune buggies. Apparently, the destination for many vehicles that passed me over the past few days. This apparently, is a common destination for "desert rats", one name attached to enthusiasts of off-road pursuits. Just past Octillo Wells, stopped in at the Blu-in cafe shown above right. Place was packed and singing happy birthday to one of the desert rats. Outside poster placards told a few stories of struggles between off-road enthusiasts and others, e.g. "Sierra Club wants to outlaw an additional 48,000 acres, we need your help and lawyers are expensive" and others of that sort. Along this next part of the route, there were occasional encampments of multiple campers/RVs and of course many off-road cycles. When asked, I've started saying my destination as "Jacksonville". Still far away for most people I talk with. Some can't imagine driving, let alone cycling all the way there. First fifty miles took only 3 hours. Here turned south on CA 86 and took a large divided road slowly southbound to Brawley. First part was still desert, but about ten miles from Brawley, saw irrigated croplands. Fun, fast day today and surprising contrasts between snow/cold starting out and sun/heat in the desert at the end. 74 miles today, 646 miles cumulative. Finished cycling California today. Cool, calm and flat early morning cycling in the Imperial Valley. Kept my head down as I was heading almost exactly into the early rising sun. At 14 miles a dramatic change as I reached the Highline Canal. This can marked the edge of the irrigated portion of the valley. Beyond, the desert began almost immediately. Some low climbing as I passed areas with "Danger" signs. Apparently, a naval gunnery practice range, so not a good place to go off-road. Another seven miles and I was in the sand hills. On the left, North Algodones Dunes Wilderness Area and on the right Imperial Dunes Recreation area. Dune buggies and off-road vehicles allowed only on the right. Many tracks still visible. As the dunes started, so started the gentle headwinds. Passing trucks would kick up an extra spray of sand. At least two sand plows patrolled the road to keep it clear. Beautiful terrain to cycle through. Small town of Glamis at mile 27, self-proclaimed "Sand Toy capital of the world". A general store and a restaurant that was only open on weekends. A poster indicated Glamis was for sale, though from the price, wasn't certain if they were serious. Stocked up on water and headed off. Next stretch was slow going with gentle climb and steady headwind. Overall, took two and a half hours for the next fifteen miles. No speed records there. Along the way, passed a mine or two, a tortoise habitat area. Also steadily came along and eventually over the Chocolate Mountains, so named because of their color. At mile 39 a motorist stopped and I was able to help him with my cycle map (to find a gas station no less!). Not too much later, crested the summit of the hill and started generally downwards again. Still a slow slog as I made my way back to cultivated lands and Palo Verde. Palo Verde was a sorry looking little town. Passed the first restaurant, but then didn't find any place that wasn't either a bar or a bait shop. Went back to the restaurant and had a surprisingly good lunch. From Palo Verde the day was starting to wear, but slowly made my way to I-10 and along the interstate. Crossed through Blythe and then over the bridge to Arizona! Hooray, one state finished, seven more to make it across! 93 miles today, 739 miles cumulative. Snowbird country. Today came past multiple large RV parks. A large transient population here from snow states to spend the winter. Climbed almost 1000ft before exiting at mile 14. Hooray, no more rumble strip! Oops, the surface of this stretch of road had its own gashes and cracks, just a little less predicatable. Was pleased to find smooth roads when I came into Quartzite for breakfast. After Quartzite, another eleven miles of I-10. Fortunately, here the rumble strip was just a narrow corrugated area a foot and a half wide immediately next to the travel lane. This left the rest of the shoulder to bike. Exit 31 and left on US-60. Stopped at Brenda, a small town four miles further. Talk amongst the patrons included "another two trailers left today". Behind the store was a park with several hundred RVs. By mid-summer all but 40 would be left. The rest, "Snowbirds" who parked their RVs for winter months and returned, typically in April or May. In the next fifty miles saw many many RV parks, advertising rates both for overnight and also for monthly or season rates (about $600 for the season). Hope was a small town at junction of AZ-72. Also an excuse to reapply sunscreen before climbing the hill past Harcuvar and in to Salome for lunch. Last thirty miles was along a long flat valley. Road also mostly straight. Picture above left shows route along the way and right shows some of the many flowers in bloom along the route. Bike glided well, though was ready for a break when reached Aguila for the evening. 84 miles today, 823 miles cumulative. Cycling from the desert to the city. Surprisingly cool in morning as started out cycling into the sun. First miles peaceful and quiet as road slowly climbed past seven-mile hill and then descended again into Wickenburg. Yesterday, I had mislaid my watch, when put on suntan lotion. With so few things to watch, I think I could have watched that more carefully. Anyways, stopped in to purchase a new watch and also mail off a brief note to the gas station in Hope, AZ to see if they found it. Will have to see. A second breakfast in Wickenburg before heading southwards towards Phoenix. Anticipation and traffic both building as I got closer. On outskirts of Sun City, encountered multiple large malls and also box stores such as home depot. Many advertisements for home communities with affordable retirement homes. 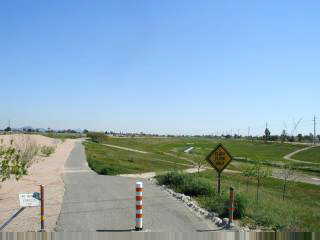 US 60 goes straight into Phoenix, but decided to cut over to the Arizona Canal at Bell Road on north side of town. Already pretty heavy traffic and not much provisions for bicycles. After morning cool, was getting surprisingly hot with sun bearing down. Found the canal and had to laugh. First part was just a drainage area with a very small creek down in the bottom. Shows the big contrast between dry and wet in the desert. Even several bridges along the way were large for a very small trickle named as river in the bottom. Found out later that the canal itself came later and was different than my little trickle I found. Despite having traveled 65 miles, maps still said another 28 to go through the city. First 14 miles went along the drainage and later the canal. Nice underpasses under many of the busy roads helped things. From here, city streets for the next 14 miles. Phoenix is reasonable about bike routes, though the city wasn't very consistent. A bike lane would suddenly disappear or be closed. Not clear what the planners/maintainers expected then. Was pleased to see Tempe signs and a hotel at the end of this first stretch. I had been following the Adventure Cycling maps and this also marked the end of part #1 of their seven maps. Yeah! 92 miles today, 915 miles cumulative. Rest day today. Partially to take a breather on reaching Phoenix and partially to get a little closer to the East Valley before tackling the mountains ahead. Left Tempe in early morning and decided to stop for breakfast a few miles down the road. Took me 23 miles before I found a place. Instead, the first 20 miles were along very quiet suburban streets such as shown above left. Passed at least six schools, though this week is Spring Break. Nobody outside and otherwise miles of small suburban streets through Tempe, Mesa and eventually to Apache Junction. Got breakfast two miles before stopping for the day. Ran a few errands such as mailing off extra CA maps, non-functioning PocketMail device, etc. Also stopped in for laundry before quiet afternoon reading and working the the PC in the motel. Definitely still snowbird country. Went to the local Village Inn pancake house at 5:30pm. Keeping a list of names for tables, perhaps due to fact that the 3-6pm early bird special was about to end. No senior discounts for the early-bird though. Woman at table across from me had a name tag with name of her RV park and Mary Jane and Minnesota on it. Apparently, the restaurant does about twice as much business in winter as summer. Also, at the local grocery store, a clerk explained to me that she had no problems getting 40 hours in the winter, but last summer was down to only 18 hours due to less business. 25 miles today, 940 miles cumulative. Overcast skies but smooth riding today. Felt like I could do a study on different types of rumble strips today as I encountered a real variety. Sometimes forcing me further into travel lanes and sometimes a nice separation. Mostly flat as I rode 17 miles to Florence Junction in early morning light. Clerk in the store told me your ears would pop when riding in a car on forthcoming hills, so I knew I was in for a bit of a climb. Renaissance Festival held on weekends near Florence Junction, so just missed it. Initial climb to Gonzales Pass at 2651 ft wasn't too hard. Even had a climbing lane (and no rumble strips) which gave me some space from the cars. A quick descent and then past Boyce Thompson Arboretum with desert plants. From here the route climbed gradually into Superior and a good place to rest for a bit. After Superior, most of the next ten miles were uphill, sometimes sharply so. Initially climbed up through a drainage along a narrow canyon. Beautiful views along the way. As you can see at left, at one point the route became narrow enough to require a short tunnel. Cars honking in the tunnel were a bit disorienting, but otherwise wasn't too bad. Climb was slow, though feels like I've been getting stronger for these sorts of routes, or the hills are getting smaller. Route left the first drainage, a short descent and then climbed again. Eventually topped out around 4600ft. From here, several open mines were visible, copper mines I believe. A little sideways and then as can be seen by picture at right, a nice descent into Miami. Miami welcome sign indicated "try our award winning restaurants". However, when cycling through town, most of the restaurant signs I saw were for simple fast foods...pizza, Wendy's, "fast food", so thought that was a little strange. After Miami came Claypool and then Globe with a fun old downtown. Tried briefly to find the Besh Ba Gowah Archaeological Park but gave up when it went too far out of town. Stopped somewhat early for the day, but had a wonderful ride. 57 miles today, 997 miles cumulative. Easy ride today through at least three different eco-zones. First a desert with many Saguaro cactus, then more dry and sandy desert. Finally, some dry farming areas as I got close to Safford. Light tailwinds and slight downhills helped make this a straightforward ride. Two miles from the start entered the San Carlos Apache Indian Reservation. Three miles further a casino on the left. A reasonable descent followed here by some rolling hills as crossed from one drainage to another. A number of cars pulling boats passed, but this stopped as I reached Peridot with the turnoff to San Carlos Reservoir. Leaving Peridot, I had just finished calculating about half million rumble bumps (~7500/mile * 70 miles), when the disappeared. I wasn't too disappointed though. Here landscape also changed as saw more open sandstone and less Saguaro. A few Joshua Tree cactus but mostly dry scrub. Route crossed some gentle bumps but mostly seemed flat. At Bylas, stopped at the Apache Market pictured above right. Local pow-wow today, including food sales. Unlike other reservations I've cycled through, this one felt pretty normal and safe. (Perhaps something about wearing lycra and looking to fill a water bottle in a bar with people who've had a bit too much to drink...). Shortly after Bylas, left the reservation. At Fort Thomas was a combination store/restaurant/pawn-shop/... Prominent signs on the door indicated specials on 1.5" PVC pipe. Inside, some old TV sets and other junk, perhaps pawned. I didn't have anything to pawn, so paid for my chocolate bar and gatorade with cash. Here saw more open farmland, though early in season to see what was planted. Also came past a woman riding a horse with a bunch of gear on the side. "Where are you headed? ", "Virginia", "Wow!, have fun!...". Seems like a horse would go several times slower than a bicycle for such a route. Came through a few small towns, Pima and Thatcher before deciding to stop in Safford for the day. Easy ride today. 74 miles today, 1071 miles cumulative. Two long hills to climb and a state border crossing. Outskirts of Safford quickly left behind in the cool morning air. A brief seat adjustment in Solomon after I passed the "State Penitentiary, do not pick up hitchhikers" sign. From here the farming area stopped and a gentile climb to where US 191 and US 70 parted ways. Picture above left shows a look back on 191 at seven miles of perfectly straight road in which almost 1000ft of elevation was gained. Still fresh, though put in lower gear to climb the hill. No shoulders but light traffic that gave me plenty of room. Cactus mostly left so more dry scrub along the way. Topped the hill at 4500ft and then a quick descent along a drainage to 3-ways stop. A ranger station, a Jehovah's Witness church, a few mobile homes and a small store named 3-ways made this intersection marked "Guthrie" on my Arizona map. Expected 2500-3000ft of climb from here so dawdled a bit and filled up on drinks and chocolate. Fourteen miles of climb to 6295ft was fairly tough, even walked a few short stretches. Hillsides were beautiful with many orange wildflowers in bloom. Looming over the top was where the road switch backed before the pass, so always present as I climbed. Finally, reached the top! Hooray. A mile further a cattle grade and six miles further the state line. The road had some slight descents, but mostly rolled as I crossed the line. Nice to finally cross over Arizona. After state line some more real descent coming into Mule Creek. Not much here other than four sorry juvenile delinquents who decided their idea of fun was harassing cyclists from their 4-wheel buggies. Got buzzed, mooned and driven right at along the way. Sigh. Route out of Mule Creek had surprisingly large hills to climb and descend, but finally got a good descent after reaching US 180. Definitely ready to stop when reached Buckhorn. Small enough town, they advertise their US Post Office with a sign on the highway one mile previous. Music for tonight (New Mexico anthem). 80 miles today, 1151 miles cumulative. Chilly morning in the tent at 5000ft. Quickly packed up and headed further downhill along US 180. Neither of the cafes in Cliff was open, so stopped by gas station to get something to tide me over until Silver City. After the first nine miles, crossed a full Gila River before following the river back up. Countryside was remote, with a few ranches such as above left, but otherwise not much along the way. Road followed river valley past Mungas before climbing more quickly up towards Silver City. Four miles before Silver City was the continental divide. From here, waters end up in the Atlantic, yeah!, nice to have signs of eastward progress. Around Silver City, the road began to roll over several hills. At Silver City, I had a choice. The Adventure Cycling Route heads eastwards over 152 and Emery Pass at 8200ft. Only 37 miles so far, but no good places to stay for a while. Decided to instead try continuing another 52 miles on US 180 towards Deming. A few more rolling hills the first ten miles past Santa Clara, Bayard and Hurley. From here the route became much flatter and much more open as it slowly descended to Deming. A light headwind was enough to keep me honest on this part. Music for today. 89 miles today, 1240 miles cumulative. Today rode out of the desert and into the Rio Grande valley. The primary route from Deming to Las Cruces is I-10, but I except for 12 miles, all of this was done on frontage roads and secondary roads. East of Deming, NM 549 is a quiet though somewhat rugged road that headed east past the Florida Mountains and through the open desert. It rejoined I-10 seventeen miles down the road, but then continued as a frontage road. Freight train shown above left in one section where 549 parallels the tracks. Another 14 miles further and time for a brunch stop. The signs said "congested area", but this route exit had only a small cafe and a mobile home. From here 12 miles of interstate with good shoulder before getting off at the next exit. Each of these exits had businesses well-marked with large billboards...stop here! Along the airport and down the hill to Las Cruces. Felt good to cross the Rio Grande and then rejoin the Adventure Cycling route. My intent had been to find the first motel after the border, but this took until northern parts of El Paso. Most motels probably along I-10 and thus not along my more industrial route. 88 miles today, 1328 miles cumulative.